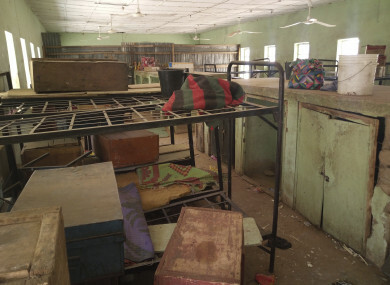 In this photo taken earlier this month luggage belonging to the kidnapped girls remains in the dormitory in the Government Girls Science and Technical College Dapchi, Nigeria. BOKO HARAM ISLAMISTS who kidnapped 110 schoolgirls in Dapchi, northeast Nigeria, just over a month ago have so far returned 101 of the students to the town, the government said today. Information Minister Lai Mohammed said the girls were released “unconditionally”. “No money changed hands,” he told reporters in the capital, Abuja. The Dapchi kidnapping on 19 February brought back painful memories of a similar abduction in Chibok in April 2014, when more than 200 girls were taken. “When we were being taken away, five of us died on the way. They brought us back this morning, dropped us outside the motor park and said we should all go home and not go to the military because they will claim to have rescued us. “They just told us on Saturday to get onto boats. We spent three days on the water before coming to shore, then they put us in vehicles and said they were taking us back home,” she said. Parents earlier told AFP the girls were brought back to Dapchi in nine vehicles at about 8.00 am. Some of the students headed to their homes in surrounding villages. “These girls were not accompanied by any security personnel. Their abductors brought them, dropped them outside the school and left, without talking to anyone. Yesterday, Amnesty International claimed that the military ignored repeated warnings about the movements of Boko Haram fighters before the kidnapping. Email “Over 100 schoolgirls kidnapped by Boko Haram freed”. Feedback on “Over 100 schoolgirls kidnapped by Boko Haram freed”.